Changes are coming to areas along the future MAX Orange Line and motorists, bicyclists and pedestrians need to heed new signals and watch for buses. 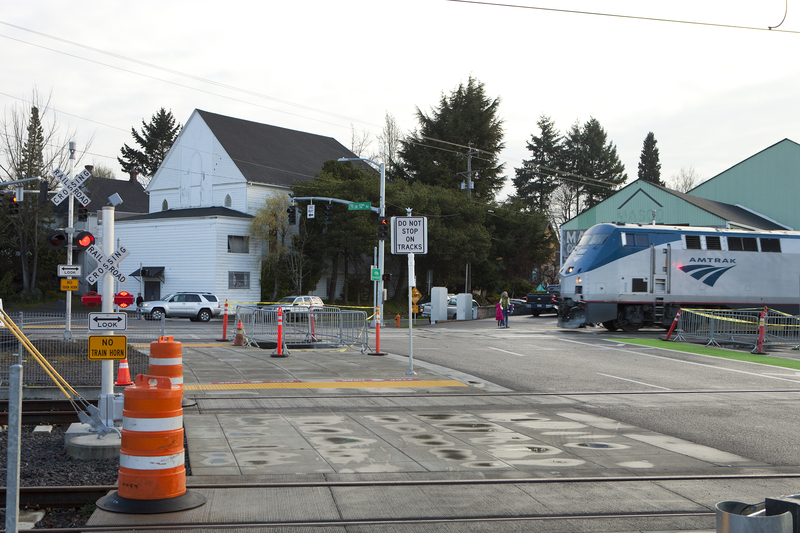 Beginning Sunday, March 1, a new Quiet Zone will be in effect at three railroad crossings in SE Portland. The Portland-Milwaukie Light Rail Transit Project, in partnership with the City of Portland and Union Pacific Railroad, made safety improvements to crossings at SE 8th, 11th and 12th avenues near Division Street that allow these crossings to be designated a Quiet Zone for both freight and light rail trains. These improvements include upgraded railroad crossings with new traffic signals, realigned intersections, concrete medians, additional crossing gates, pedestrian scale warning equipment and channelization. In a Quiet Zone, freight and light rail operators are not required to blow their train horns as they approach a crossing, although they may sound their horn if there is an immediate safety concern or adjacent light rail construction activity. Railroad warning equipment at the intersections will continue to flash and ding while trains pass through a crossing. A new Quiet Zone is in effect in SE Portland, where trains only sound their horns if there is an immediate safety issue.